A gang of masked men fired a gun during an attempted robbery at a pub in West Dunbartonshire. The three men burst into the Twisted Thistle in Dumbarton Road, Old Kilpatrick, at about 22:15 on Sunday. Two were wearing balaclavas and the other had a scarf covering his face. Three female members of staff and one male customer were in the bar at the time. Police confirmed a firearm was discharged but said no-one was injured. The three men are believed to have made off in a vehicle along Dumbarton Road, towards Dumbarton. Officers are currently reviewing CCTV footage and carrying out house-to-house inquiries. 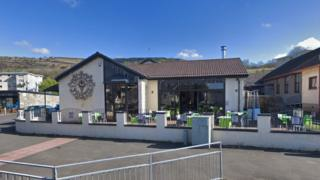 Det Insp Ogilvie Ross said: "The Twisted Thistle is a family pub and this is an incredibly rare incident in this area. However, we have increased high-visibility uniform patrols to help reassure the public. "I am appealing for anyone who was in the area at the time the incident occurred, or anyone who has information about the identity of those involved, to get in touch with me as a matter of urgency."